Today, House Joint Resolution Constitutional Amendment (HJRCA) 43 was filed to amend the Illinois Constitution in order to put an end to Congressional and legislative gerrymandering in the Land of Lincoln. 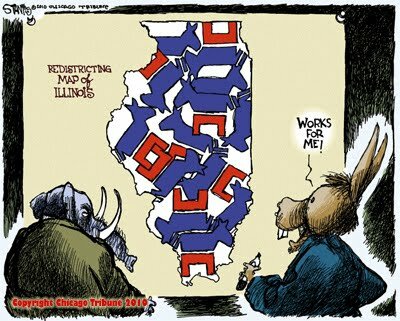 CHANGE Illinois, as a part of the Illinois Redistricting Collaborative, has spent the last four months drafting this amendment and worked with Rep. Ryan Spain (R-Peoria) to get it filed in the Illinois General Assembly. HJRCA 43 is modeled after former Rep. Jack Franks’ proposed amendment: HJRCA 58 which received 105 yes votes from the Illinois House in 2016. The Illinois Redistricting Collaborative is currently approaching General Assembly members that co-sponsored HJRCA 58 in 2016 to cosponsor this amendment. • Financials: Commissioners will be compensated & will receive appropriations for staff, office space, travel, etc. You can read the full text of the constitutional amendment (HJRCA 43) here.